Tip the mixture into a bowl and cool for a couple of minutes. Then gradually add the beaten eggs one at a time, beating well until the mixture is smooth, glossy and drops reluctantly from a spoon. Cover the bowl with a clean tea towel and leave the batter to one side to rest for 30 minutes. Fill a large saucepan no more than one third full with oil. Heat until it reaches 180'C-190'C (or a cube of bread browns in a minute). Fit a large piping bag with a large star-shaped nozzle and fill with the batter mix. Once the oil has reached the correct temperature you can start to cook the churros. Pipe 2 or 3 finger-length strips of batter directly into the pan cutting off each strip with a pair of scissors. 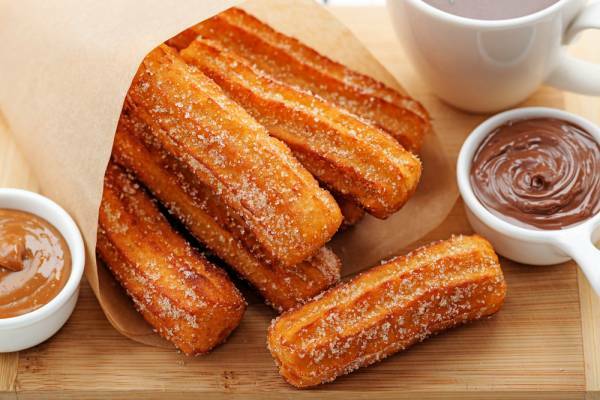 Cook the churros for about 45 seconds to one minute on each side until golden and crisp. Remove from the pan with a slotted spoon, drain quickly on kitchen paper and sprinkle liberally with demerara sugar.